CooksRecipes has quality, kitchen-tested recipes for vegetarian sandwiches that you can count on for successful deliciousness. 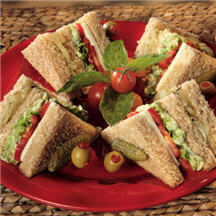 Find recipes for a variety of grilled cheese sandwiches, wraps, paninis, pita pockets, veggie melts and more. 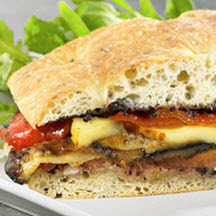 A must-try hot focaccia sandwich with black olive pesto, fried eggplant, tomato, roasted red pepper and bread cheese. 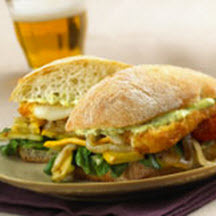 This Italian-style sandwich, layered with grilled veggies and deep-fried breaded cheese, is a super hero of a hoagie by any standard. An extraordinary vegetable club sandwich layered with sautéed onion, panela cheese, a chunky avocado cream mixture, tomato slices and crisp lettuce on whole wheat bread.